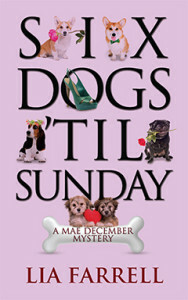 Six Dogs ’til Sunday ($15.95, 256 pages, 5×8 Trade Paperback, ISBN: 978-1-60381-250-4) is the sixth and final cozy mystery by Lia Farrell in a series featuring Mae December, the successful owner of a dog-boarding business in Rosedale, Tennessee, her sheriff fiancé and his staff, and her friends and family. The shooting of a man in an old house being used as a movie set casts new light on past cases investigated by the Rosedale Sheriff’s Office. It’s January in Rosedale, Tennessee, and Mae December is preparing for her March wedding to Sheriff Ben Bradley. Mae, who boards dogs for a living, is also busy tending to her pregnant dog and scouting locations for the movie featuring the music of her former fiancé Noah West, who died in a car accident four years earlier. Fortunately the picturesque old house at the end of Little Chapel Road is for rent. Just as filming is about to begin, a man is shot on the set, but manages to drive himself to the hospital, where he dies before he can ID his killer. He was a member of the film crew, but also a local, and circumstances point to his being a confidential informant for Ben’s predecessor, Sheriff Trey Cantrell, also the owner of the house turned movie set. At the time of the shooting, the victim had been stealing a large sum of money from a safe on the premises. Whose money is it, and where does it come from? The Rosedale Sheriff’s Office not only has another murder case on its hands, but one that will dredge up a past long buried. How far will the guilty parties go to protect their secrets? Lia Farrell is the pen name of the mother and daughter writing team of Lyn Farquhar and Lisa Fitzsimmons, who live in Michigan and Tennessee, respectively. Both are life-long readers who are also dog lovers. Lyn owns a Welsh corgi and Lisa has a Siberian husky. Lisa works as a Muralist and Interior Designer and Lyn is a Professor Emerita of Medical Education who has retired to write full-time. For more information, click here. Ben raised his eyebrows, but kept quiet as the waiter put their salad down in front of them. “Pizza will be out in a few minutes,” the young man said with a smile before returning to the kitchen. They were still the only customers in the place. “I am, but there’s no reason either of us needs to spend any time there, right?” She took a bite of crisp romaine lettuce and garlic dressing, giving Ben a reassuring look.